Burma’s president sketched a vision of gradual progress toward democracy for his isolated and authoritarian nation in his first extensive interview with a U.S. journalist, saying that the military will retain a strong role in government even as it welcomes opposition figures into parliament. The exclusive interview with Thein Sein — conducted Tuesday at his ornate presidential office in Naypyidaw by Lally Weymouth, senior associate editor for The Washington Post — offered a rare glimpse of Burma’s reclusive leadership and the soft-spoken, bespectacled former general at its head. Thein Sein used the interview to make a direct, public case that the United States and other nations should lift long-standing economic sanctions that he said hurt the Southeast Asian nation’s 54 million people and now threaten to hold back economic progress. He said his government already had complied with several Western demands — including freeing most political prisoners, scheduling elections in April and allowing opposition leader Aung San Suu Kyi, a Nobel Peace Prize laureate, to potentially join the government as a member of parliament. He did not rule out the possibility that, someday, she might even join the cabinet. “What is needed from the Western countries is for them to do their part,” Thein Sein said. Long known for its bounty of natural resources such as gold, natural gas and lumber, Burma now lags far behind most of its Asian peers in poverty rates, education levels and infrastructure. It has been ravaged by decades of civil war, corruption, brutal rule by a succession of military leaders and bloody repression of democracy activists. Many critics of the government say they believe that sanctions played a role in spurring political reforms within Burma and its unexpectedly warm outreach to the West in recent months. Suu Kyi, in a separate interview with Weymouth on Wednesday, said she was unconvinced that Western nations should lift sanctions. “Engage and lift sanctions when they think the time is right,” she said. Burma’s accelerating reforms have been embraced by the Obama administration. 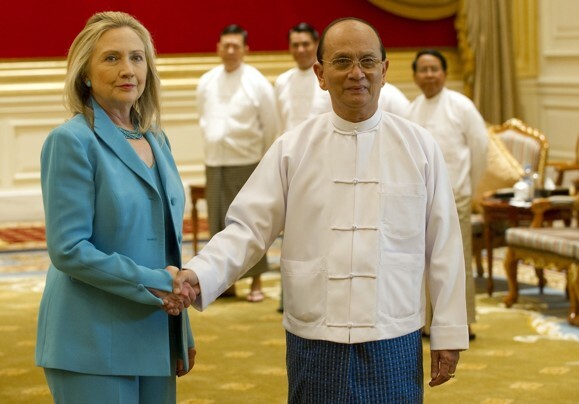 In November, Secretary of State Hillary Rodham Clinton visited Burma, the first such visit there since the military took over the government in 1962. Last week, Obama announced that he would appoint an ambassador to repair diplomatic ties with Burma, also known as Myanmar. U.S. officials say they are juggling their efforts to reward Burma’s reforms even as they watch and wait for continued progress. The administration needs to consult with several members of Congress who have only recently started making trips to Burma to assess the situation. Congressional approval on sanctions will likely take time. As with most of those in Burma’s ruling elite, little is known about Thein Sein, including how much control he now retains over the powerful military. Even those in the United States working most closely with their Burmese counterparts say they are unclear on how decisions are made. 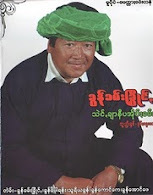 Thein Sein served for years as prime minister. The position was several steps below that of Senior Gen. Than Shwe, the junta’s longtime leader, but Thein Sein often traveled abroad. Some U.S. officials believe that may have exposed him to just how far Burma has been left behind in the new global economy. In the interview, Thein Sein stopped far short of guaranteeing the nation a full slate of democratic freedoms, balking at the possibility of ending censorship of Burma’s growing press while extolling “peace and stability” as core goals of his government. The military no longer has a formal role in the nation’s executive branch, he said, but it controls one-fourth of the seats in parliament. Of the more than 600 seats overall, 48 are up for election April 1. “We cannot leave the military behind because we require the military’s participation in our country’s development,” he said. Thein Sein expressed clear desire to bring desperately needed economic development to Burma. But also evident was a sense of the limitations he may be facing in pushing for change amid various factions — including hard-line military leaders, democracy activists and several ethnic minority groups that remain locked in a bloody civil war with Burma’s army.